Hey guys! It's Space Day! Have you made fun plans with your kids? We made some plans that will take us into the weekend so - having now thought this through a little more - I'm going to give you the weekend to fulfill your plans and write up a post and share any pictures you would like to share! Over the course of this weekend, come leave a comment HERE on THIS POST. The Work of His Hands is being published by Concordia Publishing House and they have rather generously offered a giveaway of this brand new title! I'm being sent a copy for review and I'll post my review of it at the first of June. Furthermore, when it is released, one of you will win a brand-spakin' new copy of it! Take a look from an Astronaut's office window in the International Space Station (ISS). 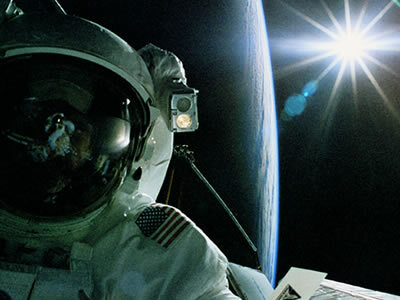 Join Colonel Jeff N. Williams as he recounts his experiences and adventures in outer space. 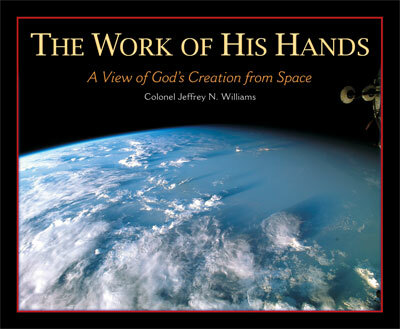 In this coffee table friendly book, Colonel Williams offers a unique Christian perspective on God's creation and shares over 80,000 photos he took in the ISS. Sounds rather amazing, does it not? I will also draw a runner-up prize of a sweet little vintage treat. 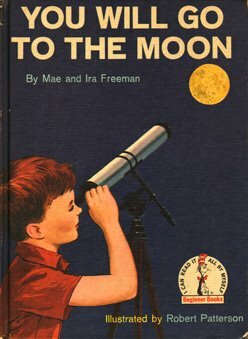 I found a copy of You Will Go to the Moon , copyright 1959, at a local antique shop a few weeks back. It's such a fun book as it gives a history of America's past fascination and history of space explorations in a way that children can grasp hold of. Quite a bit has changed since 1959 and I have to grin at various explanations and illustrations in this book. I do so love vintage books though and this one is a fun one to share with kids. So one of you will win a copy of this also. All you have to do to win? Do something - anything - space related with your children or someone you know today. I don't care if it's coloring a picture, reading a book, playing a game, watching a space-themed movie, or decorating a space-themed cake! Any space activity qualifies you and delights me. Then, create a short post sharing with others what you did to celebrate the day. Share pictures if you like and link back to this post! Leave a comment here and I'll select a winner. I'll announce the winner on Monday evening when I share what we did over the weekend in honor and celebration of Space Day. It's fun finding reasons to celebrate life and creation. I don't think we take enough opportunities to do unique things to celebrate.......LIFE!.......and the fact that we're living it. It's so, so easy to be bogged down by the stresses. Plug in some fun and then come back and share! And if only one of you do this - then you are an automatic winner! So go have some spur of the moment fun! Thanks, Concordia, for joining in with us! What a blessing this is! We love books at our house and especially the old ones and learning ones! Now I'm trying to brainstorm an activity! My son struggles with understanding time and often things that after an afternoon nap that it is a new day. We've discussed several times this weekend how the earth rotates around the sun. I see making a solar system mobile in our near future. My kids love to look at the moon, and will beg to go out at night to go see it. We played a game with the phases of the moon, and it was a hit!